The Colours are two large flags which are the embodiment of the spirit of the regiment. The King's, or first colour of every regiment, is to be the Great Union throughout. The second Colour to be the colour of the facing of the regiment, with the Union in the upper canton; except those regiments which are faced with red, white, or black. The second colour of those regiments which are faced with red or white, is to be the red cross of St. George in a white field, and the Union in the upper canton. The second colour of those which are faced with black, is to be St. George's cross throughout; Union in the upper canton; the three other cantons, black. In the center of each colour is to be painted, or embroidered, in gold Roman characters, the number of the rank of the regiment, within the wreath of roses and thistles on the same stalk; except those regiments which are allowed to wear any royal devices, or ancient badges; on whose colours the rank of the regiment is to be painted, or embroidered, towards the upper corner. The size of the colours to be six feet six inches flying, and six feet deep on the pike. The length of the pike (spear and ferril included) to be nine feet ten inches. The cords and tassels of the whole to be crimson and gold mixed. To carry the Colours was to put oneself in a position of extreme danger, being so conspicuous, but also the most honorable position as well. The Colours, being so large, could be easily seen in the smoke and mayhem of 18th Century combat and were useful to battlefield commanders who might otherwise lose track of where his units were. The Colours were carried by Ensigns, junior officers, and served as a rally point for a regiment in battle. It was not completely unheard of for Sergeants in the American Revolution to carry the Colours if there were no available officers to do it. Sgt. Robert Lamb of the 23rd did so at the Battle of Camden and noted it in his autobiography. More examples appear in the Napoleonic Wars where officer casualties, and casualties in general, were exceptionally high. 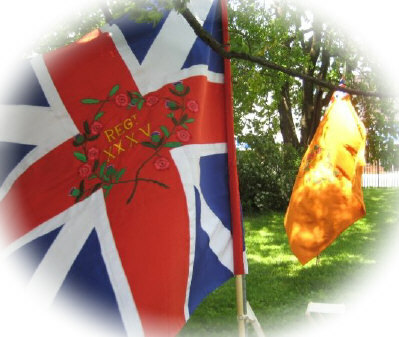 The Colours were regarded with an almost sacred deference, death being preferable than to see any misfortune happen to the flags which represented the history and traditions of the regiment. To capture an enemy's Colours was considered a remarkable triumph to the victor and a terrible loss to its parent regiment. The poor 7th Royal Fusiliers suffered the loss of their Colours twice in the American Revolution: first at Ft. Chambly, 1775, (they were replaced) and then those lost at the Battle of Cowpens, 1781. The Colours of the 35th were carried proudly in battle and never fell into the hands of the enemy in the American Revolution. At the fall of Ft. Wm. Henry in 1757, the Marquis de Montcalm allowed the surrendering 35th to proceed out of fort with full honors--keeping their arms, keeping their drums, and keeping their Colours. The King's Colours of the 35th Foot were raised above Malta in 1804 when the British captured that island in the Napoleonic Wars. The Royal Sussex returned to Malta in 1964 for ceremonial purposes when the island was given full independence from the United Kingdom.